After finishing a hearty lunch at Rico's Lechon in their Mactan branch, we drove all the way back to SRP while beating the early afternoon traffic in Mandaue City. 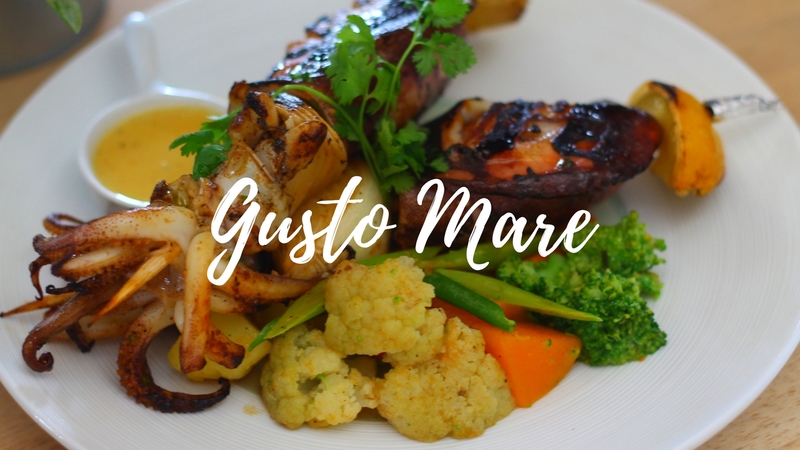 Gusto Mare is located at IL Corso, a newly opened mall in SRP. The Italian-themed restaurant belongs to one company that also manages Anzani and District 53rd. That's why I got surprised when I saw the same manager of District 53rd in Gusto Mare, gracing the event. Spinaci Zola Dip - Spinach and Gorgonizola cheese dip with homemade pizza crust. Salmone Pizza - Tomato Sauce, mozarella, smoked salmon, cream cheese, and coriander. Piemontese Pizza - Fontina Cheese, green asparagus, and truffle paste. My personal faves are Salmone Pizza and the Grilled Squid Skewer. The Piemontese Pizza is also good however I found the truffle paste a bit strong. But nonetheless, it's a delectable dish. Aside from the resto's food, I personally loved the ambiance. It's relatively far from the hustle and bustle of the city thus the chill vibe inside the restaurant. And did I mention that the Il Corso property is a perfect place for a #OOTD? Maybe I should switch niche? Nah. Promise, it's worth the travel!